When it comes to meat, you basically have four choices. You can eat red meat, which would mean beef and pork. You could consume some type of processed meat. You can eat white meat, or poultry (i.e., chicken, turkey, and duck). Or, you could consume fish which would include cold-water fatty fish and all other forms of fish. For those who know what they are talking about, from a health stand point processed meat refers to the various age old methods of meat preservation that were used to preserve meat before refrigeration was developed; and would include salting, drying or aging, pickling, smoking, and, of course, cured deli-style meats. That is to say, that when a large animal was slaughter for food thousands of years ago, some type of meat preservation method had to be used before the animal rotted and the meat went bad. Historically, meat preservation techniques were great for survival, but not quite so good for health. In the modern world, you can translate all references to processed meat to be referring mostly to cured deli-style meats such as salami, bologna, and pastrami that are preserved in long tubes with lots of chemical perspectives, such as sodium nitrate even if most consumers today purchased sandwich meat already sliced thin and nicely packaged. The Consumption of Red and Processed Meat increases your risk of stroke. For a very long time, the scientific nutrition community has been aware of the fact that the long term consumption of red meat has a lot of very negative health consequences associated with it. There is yet another recent study that found that the consumption of both red and processed meat increased the risk of stroke in women. In Sweden, women who ate the most processed meat were at 24 percent greater risk for stroke caused by blockage of an artery that supplies blood to the brain, or cerebral infarction, than women who ate less were. For red meat consumption of at least 3 ounces a day, the risk was determined to be 22 percent greater. So, what is so wrong about these forms of meat? For processed meat, quite obviously the risk is due to the chemicals used to preserve meat, which are toxic to your health, in general, and can cause high-blood pressure. The Consumption of Healthy Fish decreases your risk of stroke. 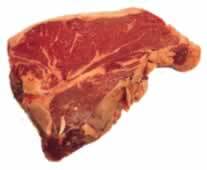 All the different forms of meat; red, white, and fish; have a different fat profile associated with them. I would wager that the healthy fats found in fish would offer long-term consumers of fish many different health benefits. In fact, the same lead author of this red meat stroke study shown below published similar research a few days later that showed that the regular consumption of fish reduced the risk of this type of a stroke in women. Since it is the high saturated fat content of red meat that is the problem, many healthy choices exist other than total avoidance. Healthy food choices for the consumption of red meat exists. You can restrict your intake of red meat to only the extra lean cuts. You can reduce the amount of red meat in your diet. You can consume more cold-water fatty fish in your diet. And, you can use a cooking technique that drains most of the harmful fat off of red meat. Supplementing with Vitamin D is a Good Fix! An effective and easy way to deal with eating meat in your otherwise healthy diet is to supplement with vitamin D on a daily basis. The negatives of red meat, and meat in general, has to do with an unknown factor that has nothing to do with its fat content. Some health authorities claim that eating meat boosts your body's requirement for Vitamin D. Thus, supplementing with Vitamin D can kill two birds with one stone. Vitamin D will allow you to occasionally enjoy meat in your diet, while keeping you in good health as much as it is impossible to do so; while you work on improving your natural whole food diet. Red meat consumption and risk of stroke in Swedish women. Larsson SC, Virtamo J, Wolk A.
Stroke. 2011 Feb;42(2):324-9. Epub 2010 Dec 16. Fish consumption and risk of stroke in Swedish women. Am J Clin Nutr. 2011 Mar;93(3):487-93. Epub 2010 Dec 29.